Big win over Ontario makes Galion the team to beat. 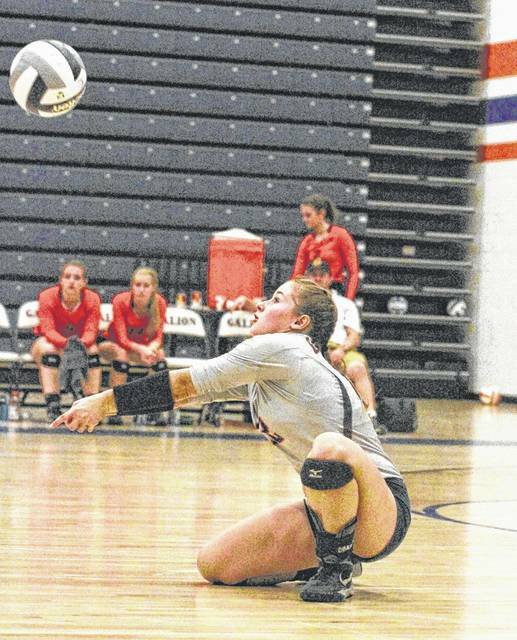 Galion's Nicole Thomas digs out a kill attempt during Tuesday's home action against the Ontario Lady Warriors. The Lady Tigers defeated the visitors in five sets to gain sole possession of first place in the MOAC. Kasidee Sinclair aims to get the Galion offensive going during Thursday night’s action at Buckeye Valley. The Lady Tigers defeated the Barons in three sets to remain undefeated in MOAC play. DELAWARE — On Aug. 26, Galion lost a home match to Willard. 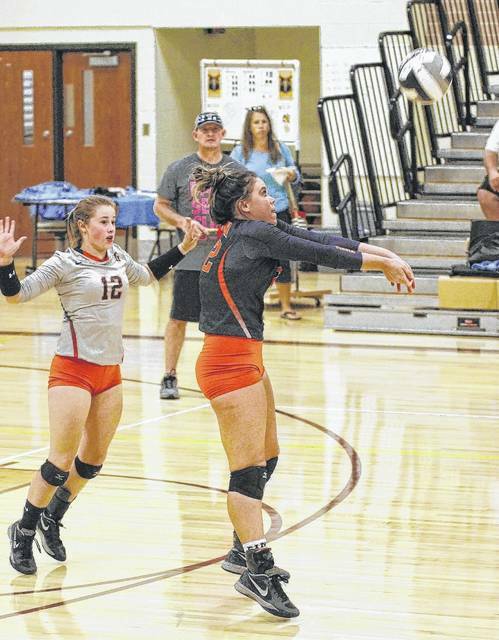 That loss to the Flashes apparently lit a fire under the Tiger ladies and they’ve not lost since, the most recent victory a 3-0 sweep of Buckeye Valley on Thursday. The Lady Tigers are 9-1 overall on the season and perfect in the Mid-Ohio Athletic Conference at 7-0. Kayla Hardy came up big for Galion on both sides of the ball at Buckeye Valley. Hardy racked up 34 of the 38 Tigers’ assists on 82/85 setting, picked up 14 digs on defense and served at a 17/18 clip en route to 14 points and two aces in the victory. Nicole Thomas was 18/21 for 16 points and four aces. On defense, Thomas led the team with 17 digs. Other service stats for Galion: Team- 64/72, 47 points and 12 aces; Kate Schieber- 7/7, 5 points and an ace; Marisa Gwinner- 8/8, 4 points and an ace; Abby Foust- 4/5, 4 points and an ace; Kasidee Sinclair- 6/7, 2 points and 2 aces and Jaden Ivy- 4/6, 2 points and an ace. At the net, it was the duo of Gwinner and Samantha Comer leading the attack. Gwinner wrapped the night with 21 kills and Comer chipped in 10 kills en route to the conference victory. Other offensive stats for Galion were: Ivy- 8 kills; Sinclair- 5 kills; Gillian Miller- 2 kills and an assist; Schieber- 2 assists and Foust- an assist. Defensively for Galion, the Lady Tigers were 35/37 on service reception, racked up five total blocks and notched 72 digs. Gwinner led with two solo blocks and three assisted. Ivy assisted on three blocks as well for the visitors on Thursday night. Like Hardy, Sinclair would also earn 14 digs in the win. Other defensive stats for Galion were: Gwinner and Ivy- 8 digs apiece; Schieber- 6 digs; Comer- 3 digs; Miller and Foust- a dig each. The Lady Tigers will hit the road early on Saturday morning to head to the Shelby Invite. MOAC play will pick back up for Galion on Tuesday, Sept. 19 when the Pleasant Lady Spartans head to Galion’s home floor for a much anticipated match-up among two of the top teams in the league. GALION — In another key MOAC matchup, on Tuesday, Galion’s young team handed Ontario its first league loss of the season. It took five sets, but the Lady Tigers outlasted the visitors to take sole possession atop the MOAC 25-16, 23-25, 25-22, 21-25 and 15-8. Galion is now 8-1 overall on the 2017 season and 6-0 in the league. Ontario dropped to 8-2 overall and 5-1 in conference play. Serving was an integral element in Galion’s success on Tuesday evening. For the match, the Tigers served at a 97/105 clip, earning 57 total points while recording 13 aces as a team. Nicole Thomas led the way for Galion, going 19/20 on her service attempts, racking up 14 points and three aces. Kasidee Sinclair served her way to 13 points on 19/21 serving for two aces. Kate Scheiber also recorded double-digit points for the Tigers on the serve, earning 10 points on 16/18 serving while notching two aces. Other serving stats for the home team were: Kayla Hardy- 18/18, 9 points, 3 aces; Jaden Ivy- 11/13, five points, two aces; Marisa Gwinner- 12/13, 5 points, an ace and Abby Foust- 2/2, point. Gwinner turned in 21 kills on the night and Samantha Comer recorded 20 kills to lead the Tigers. Sinclair had 10. Gillian Miller had six kills and Ivy four kills. As a team, Galion turned in 57 total assists on Tuesday, led by 54 assists from Hardy on 138/140 ball handling. Schieber provided the remaining three assists on a 9/9 handling night. Defensively, the Lady Tigers netted 11 total blocks and 112 digs as a team. Gwinner was the top-blocker on the evening, recording four solo blocks and four assisted blocks while also racking up 15 digs . Ivy assisted on four blocks and would also turn in a 15-dig performance. Other defensive stats for Galion were: Sinclair- 28 digs, solo block, assisted block; Comer- 7 digs, assisted block; Miller- 2 digs, assisted block; Hardy- 14 digs; Schieber- 14 digs; Thomas- 14 digs and Foust- 3 digs. Galion’s Nicole Thomas digs out a kill attempt during Tuesday’s home action against the Ontario Lady Warriors. The Lady Tigers defeated the visitors in five sets to gain sole possession of first place in the MOAC. https://www.galioninquirer.com/wp-content/uploads/sites/38/2017/09/web1_nic-again.jpgGalion’s Nicole Thomas digs out a kill attempt during Tuesday’s home action against the Ontario Lady Warriors. The Lady Tigers defeated the visitors in five sets to gain sole possession of first place in the MOAC. https://www.galioninquirer.com/wp-content/uploads/sites/38/2017/09/web1_kas-again.jpgKasidee Sinclair aims to get the Galion offensive going during Thursday night’s action at Buckeye Valley. The Lady Tigers defeated the Barons in three sets to remain undefeated in MOAC play.